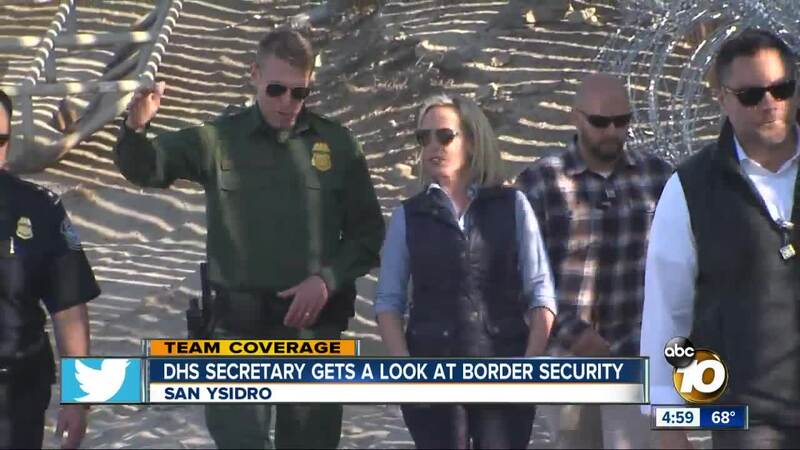 SAN DIEGO (KGTV) - Homeland Security Secretary Kirstjen Nielsen is visiting Border Field State Park in the South Bay Tuesday to get a firsthand look at the ongoing efforts to secure the border. 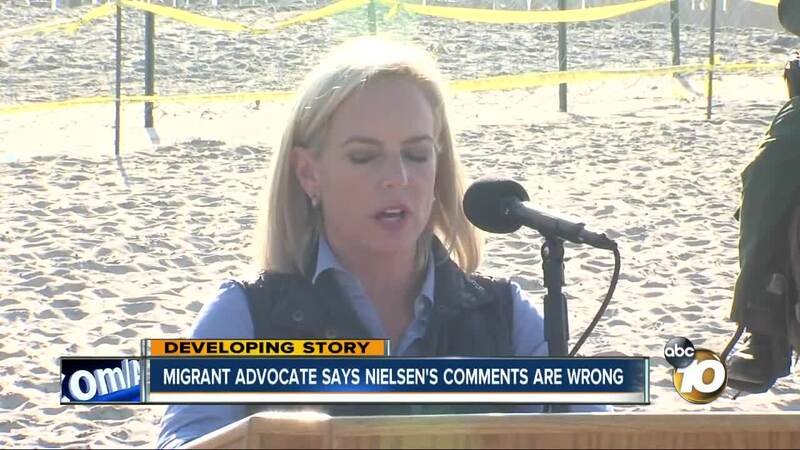 Nielsen is expected to view the reinforced security measures installed at the southern border ports of entry in response to a caravan of Central American migrants hoping to enter the U.S. to seek asylum. The Homeland Security head is also updating the media regarding the next steps in border security plans. Many migrants from the caravan have arrived in Tijuana, Mexico, in the past week to 10 days with hopes of gaining entry into the United States. However, U.S. military troops deployed to the border by President Trump have stepped up security and may soon be given the go-ahead to use force if they face acts of violence from migrants. On Monday morning, Customs and Border Protection officials shut down northbound entry into the U.S. from Mexico at the San Ysidro Port of Entry for over three hours after learning of a possible attempt by migrants to rush the border and overwhelm security. Movable barriers and other security measures were installed, but the rush never occurred. In response to a recent report that the military's mission at the border will end on Dec. 15, U.S. Army officials said: "We are continually assessing our resources and refining requirements in close coordination with DHS. We may shift some forces to other areas of the border to engineering support missions in California and other areas. No specific timeline for redeployment has been determined. We will provide more details as they become available. Meanwhile, a judge blocked part of Trump’s proclamation that denies asylum for anyone who crosses U.S. ports of entry unlawfully. The judge ruled Trump’s proclamation violated federal law. According to Homeland Security officials, around 70,000 people per year claim asylum between official ports of entry. As of Nov. 19, 107 people have been detained between official crossings since the president’s order took effect, Homeland Security officials said.